Book Information: The family life of Mama, Papa and their little girl revolves around music. Mama plays her piano every night after dinner, and music fills the family’s hearts and lives. As the war encroaches from outside, the music must compete with the sound of marching in the streets and the sound of planes in the sky. As times grow hard, there is less dinner and more music. Mama and Papa become sadder and more worried until finally their little girl wakes up to find that the piano itself has gone, gone during the night and replaced by a bag of potatoes. Undaunted, Mama and Papa still dream of their music, which, once in their hearts, can never be taken away, just as their love for each other can never be taken away. Brief Bio: Tasmanian author/illustrator Christina Booth has been drawing and writing for as long as she can remember. Christina grew up on Tasmania’s east coast surrounded by state reserves, sand dunes and beaches. This fostered a deep appreciation of the unique textures and colours, native flora and fauna that can only be found in this part of the world. As an artist, Christina tells stories visually and as an author combines her illustrations with words to fill the senses, inspired by her surroundings. Christina is passionate about art being accessible to all. As an author/illustrator she believes that a most wonderful way to learn about the world is through quality picture books and inspiring stories that make us think and challenge us to take the next step forward. Through her love of books and art, Christina enjoys sharing her enthusiasm with kids and adults alike. Potato Music is Christina’s 13th children’s book, her third as author. 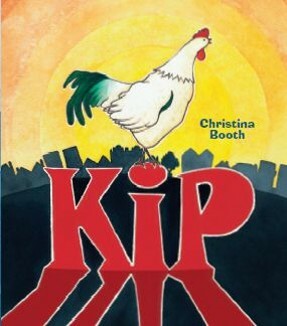 Book Information: When Kip finds his voice and begins to crow he causes all sorts of problems for Mrs Bea’s neighbours. Reluctantly, Mrs Bea sends him away, but much to the neighbours’ surprise, life is not as good as they thought it would be without him.